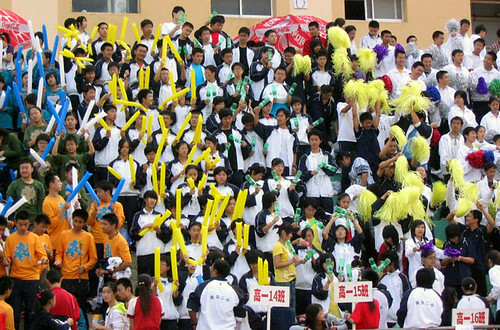 A few Saturdays ago Qingdao Number Two held its autumn sports assembly. The day began with an opening ceremony in which each class marched around the school track wearing costumes. My fellow foreign teacher, Annie, and I were asked to participate along with our Year 1 class. They provided us with Qing era outfits and fans to wave as we marched along. While our class’s performance was rather subdued, others went all out with balloons, streamers, and fireworks. One class released a cage full of white doves; another had life-sized inflatable costumes of the 2008 Olympic mascots. It was quite the spectacle. After the opening ceremonies the sports events began. There were a variety of track and field events: foot races, high jump, javelin throw, long jump, etc. I wondered around taking photos. It was a warm clear day, perfect for a little friendly competition. The following Monday I asked my students what they thought of the events. Most seemed to enjoy it but many complained of being tired from the long day. Nearly three weeks and no updates! I know what you must be thinking: Stew has gone off on some adventure and is too busy trekking along some wild road or herding water buffalo in southern China. The truth is I have fallen into the daily rhythm of life here at Qingdao Number 2, and while it is not always exciting it does keep me busy. The student’s day begins bright and early at 6:30 when they leave their dorms for breakfast. I have quized my students about their living conditions I hear nothing but complaints, who could blame them; eight students share a cramped room. On Mondays there is a flag raising ceremony in the school’s main square. The first classes begin at 8. Lunchtime can be a challenge, with 2000 students all making their way to the cafeteria at roughly the same time. Teachers have their own dinning facility, which leaves a lot to be desired. At least it is cheap; a meal typically cost around 4 Yuan (about 50 cents). The students tell me their food is not too bad but a little more expensive. I have yet to eat in the students dinning hall; I’ll provide a full report when I do. My first class begins at 2 pm, which gives me the morning to prepare lessons and make photocopies (when the copier is working that is.) When I first arrived, the school told me the copier would be too complicated for me to figure out so I gave documents to an office worker who would return my copies a day or so two later. I have since made the bold move to make my own copies, without any problems. I have 3 classes in the afternoon, and then a dinner break at 5:30. Sometimes I will hurry to the dinning room before it closes, but more often I eat something in my office. My last class ends at 7:30 at which time I retire to my apartment or go grocery shopping. The students study in their classrooms until 10pm. The campus fills with a cacophony of shouts and murmuring voices as they head back to their dormitories. They have about 20 minuets to get ready for bed before the electricity in the dorms is shut off. So there you have a typical day at Qingdao Number 2. The school week is Monday thru Saturday. Students go home on Saturday afternoon and return around 6:30 on Sunday evening. Sometimes Saturday is filled with a school wide activity. Today was sports day, which I save for another post. 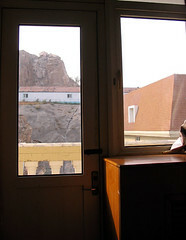 My apartment came equipped with a fairly nice view and a very small washing machine. While not the latest and greatest, it is completely functional. I must manually fill the basin with water, empty it after the wash cycle and repeat in order to rinse. There is no dryer, but a built in spinner which gets the clothes from soaking to damp. From there I hang my laundry on the clothesline strung across my balcony. The other day, following bringing in the laundry, I prepared to head out and run some errands. Just before stepping out the door I felt a stone in my shoe, and after removing the shoe determined the rock was in my sock. Upon turning my sock inside-out a rather large beetle felt out onto the floor. I let out a girlish scream, and then grabbed my camera to document the offending creature. Below is the result. I have the week off thanks to China’s National Day. It used to only be a two day holiday but the central government expanded it to 5 days in an attempt to stimulate domestic spending. All of the students have gone home and campus is quiet for a change. With a week off from work I have finally had a chance to take in some of my surroundings. My decision to come to Qingdao was fortuitous. It is a medium sized city and I have not felt the overwhelming crush of traffic/crowds/noise/etc. that I felt in Beijing or Shanghai. A large percent of the population is fairly affluent so I can find just about anything I want/need. Finally, while I am not being paid much, I am doing something I love. 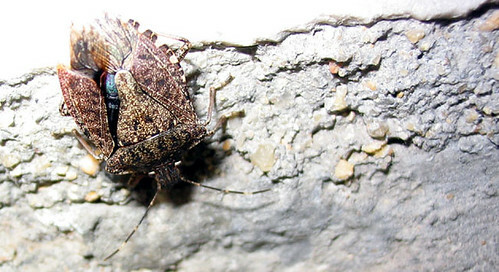 With all these positives I can deal with the occasional bug in my sock.